Ah, summer in Seattle. Mariners games. Sounders matches. Getting away to the beach, the mountains or a park. All kinds of events around the region. And of course, road construction. Testing in the I-90 tunnels in Mercer Island and Seattle. 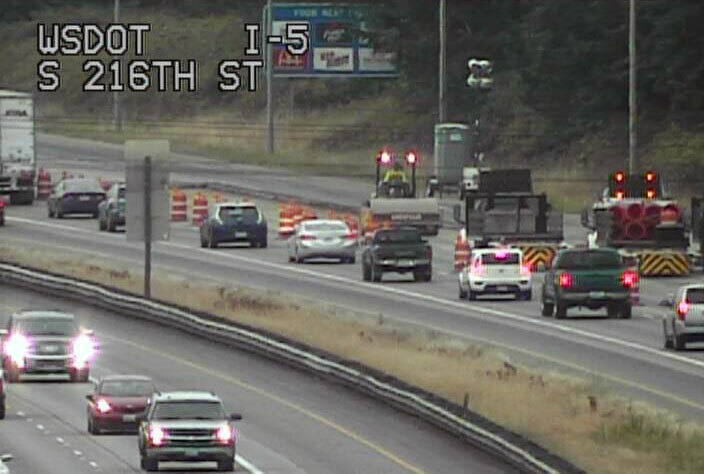 Repaving on northbound I-5 from SR 516 to South 188th Street in SeaTac. Repairs on the southbound I-5 Ship Canal Bridge in Seattle. All this work coincides with a Mariners homestand throughout the weekend, The Susan B. Komen Race for the Cure Sunday morning and a Sunday night Sounders match at CenturyLink Field. You can get to any of these events – all of them, if you're really ambitious – with a little bit of planning around our road work. From 9 p.m. Friday until 9 a.m. Saturday, eastbound I-90 will reduce to a single lane at Rainier Avenue then traffic will be routed to the express lanes. 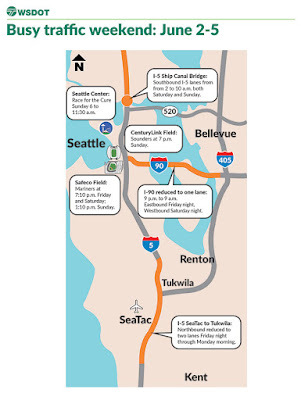 From 9 p.m. Saturday until 9 a.m. Sunday, westbound I-90 will reduce to a single lane at Bellevue Way then traffic will be routed to the express lanes. On Sunday, permanent HOV lanes on I-90 across the lake will be in place, providing a more reliable trip between Issaquah and Seattle that doesn't depend on the direction of the express lanes. With the HOV lanes open, the I-90 express lanes will close for good so Sound Transit can build its East Link light rail extension between Seattle and Redmond. If you're heading back to the Eastside after the Mariners game or another event in Seattle Friday night, plan ahead as we'll see congestion leaving the city. Taking transit or carpooling will help reduce regional congestion. 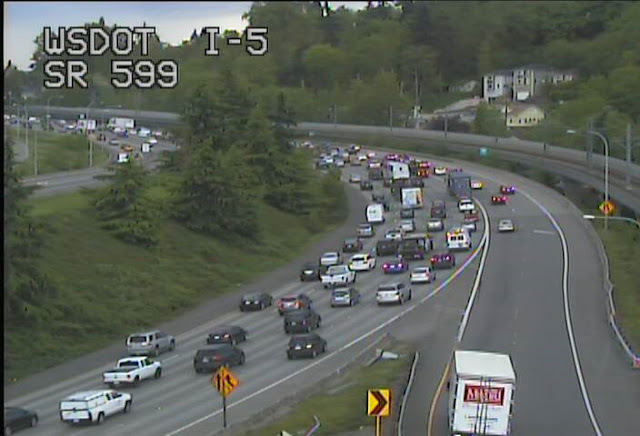 Consider taking SR 520 or driving around the lake if possible, but expect congestion there too. Sunday morning if you're heading to Seattle to Race for the Cure or anything else before 9 a.m., leave early or use alternate routes. Our contractor crews will pave asphalt over the old concrete between SR 516 and the Southcenter area. From 8 p.m. Friday to 5 a.m. Monday, northbound I-5 will be down to two lanes at SR 516. The SR 516 on-ramp to northbound I-5, the off- and on-ramps at Military Road and South 188th Street/Orillia Road will also be closed. Take transit – a bus or light rail allows you to relax and reduces the number of cars on the road. Use alternative routes – SR 99, SR 509, SR 167 and I-405 can take you around the I-5 backups. Avoid using I-5 late morning through the early evening. Going earlier or later can help you dodge the heaviest congestion. The deck has some small bad patches of concrete that we need to jackhammer out and repave. We'll start closing lanes at 2 a.m. early Saturday and Sunday mornings and start the noisiest work at 5 a.m. each day. On Saturday we'll work on the two right lanes and close the Northeast 45th Street on-ramp to southbound I-5. On Sunday we'll repair the two left lanes, and all ramps will remain open. 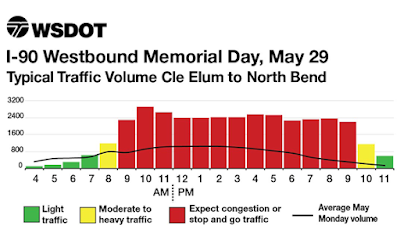 The most important thing is, if you're traveling across the southbound Ship Canal Bridge Saturday or Sunday morning and you have to be somewhere on schedule, give yourself a cushion and leave early. This really matters Sunday morning because our crews will still be at work when you're going to Race for the Cure. The Mariners' first pitch Sunday is at 1:10 p.m. and while our crews will be off the road by 10 a.m., the backups will linger. You can also try SR 99. Whatever you do, plan ahead. We know we've planned a lot of work this weekend considering all the other events that are scheduled. But we have so many projects that need weekend hours, we have to work when we can. 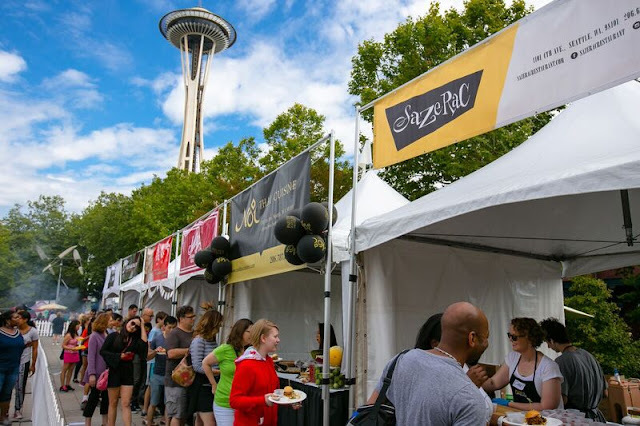 The only weekends that are off-limits this summer are June 10-11 for the University of Washington's graduation ceremonies and Aug. 5-6 for the Seafair boat races and Blue Angels. There may be work on every other weekend this summer as it's the only way we can finish this important work and keep traffic moving. Much of this work needs dry weather to be completed. We know it's not easy to get around with these closures, and we appreciate your patience. Doug Baldwin spends many Sundays thinking about hard-hitting safeties, but he had a different kind of safety on his mind this past Sunday – train tracks. 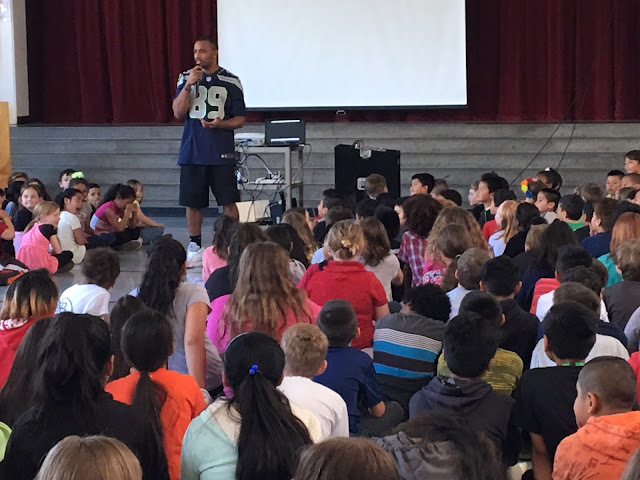 Baldwin, along with some Sea Gals, helped us spread our train safety message to more than 300 children and adults from the South Sound region. The Seahawks' Pro Bowl wide receiver and Super Bowl XLVIII champion met personally with some lucky contest winners and also engaged the crowd as a whole on how to be safer around trains. 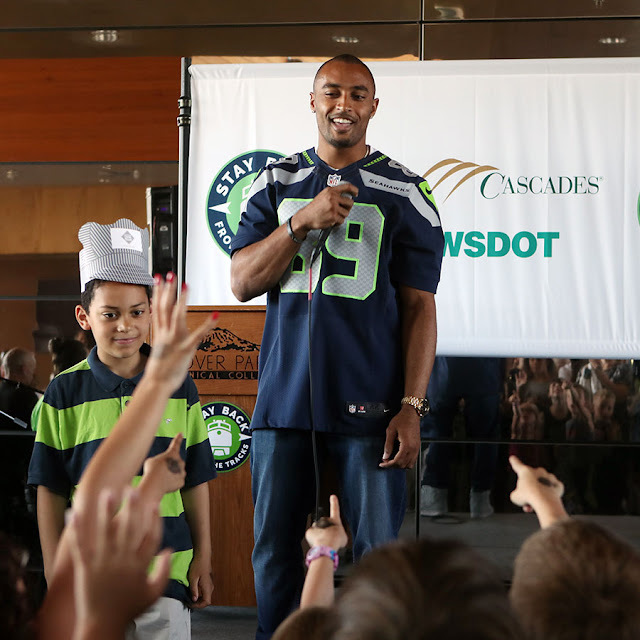 Seahawks star Doug Baldwin helped us spread the message about railroad safety at an event earlier this month in Lakewood. 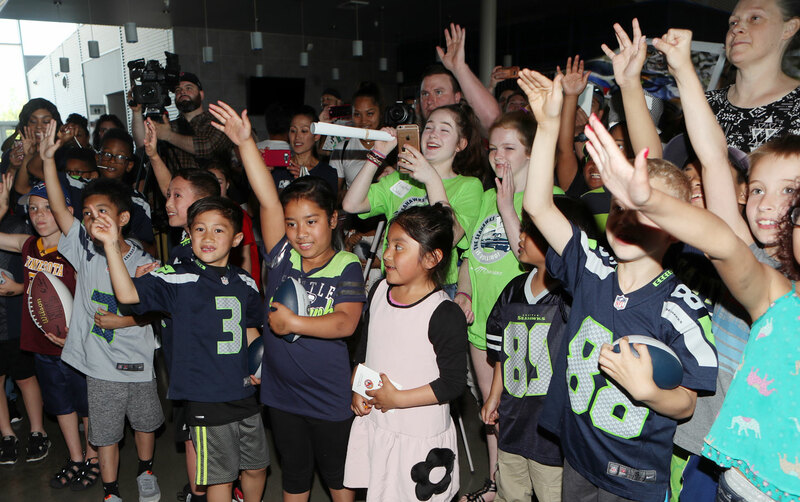 The event is a part of the larger Stay Back from the Tracks safety campaign that we, the Seahawks and Operation Lifesaver designed to get area residents ready before passenger trains are rerouted through Tacoma, Lakewood, JBLM, and DuPont in the fall. Never walk on train tracks. They're private property and it's just not safe to be on them. Don't assume a train can stop to avoid someone on the tracks – it takes more than a mile before a heavy train can stop – that's more than 18 football fields. Never cross a train/road intersection if the gates are down or lights are flashing. Trains can travel in either direction, so just because one has passed doesn't mean another isn't coming from the other way. Baldwin's message Sunday was simple: Everyone needs to be safe around train tracks. and aware around railroad tracks at our safety event in Lakewood on May 28. He reminded participants about the risks around train tracks and then "played" an interactive train safety video game with the crowd. The game has several built-in safety messages, including to never cut across tracks as a short cut and to always obey signals and lights. While Baldwin was the star attraction, children and families also enjoyed several other train-related activities. 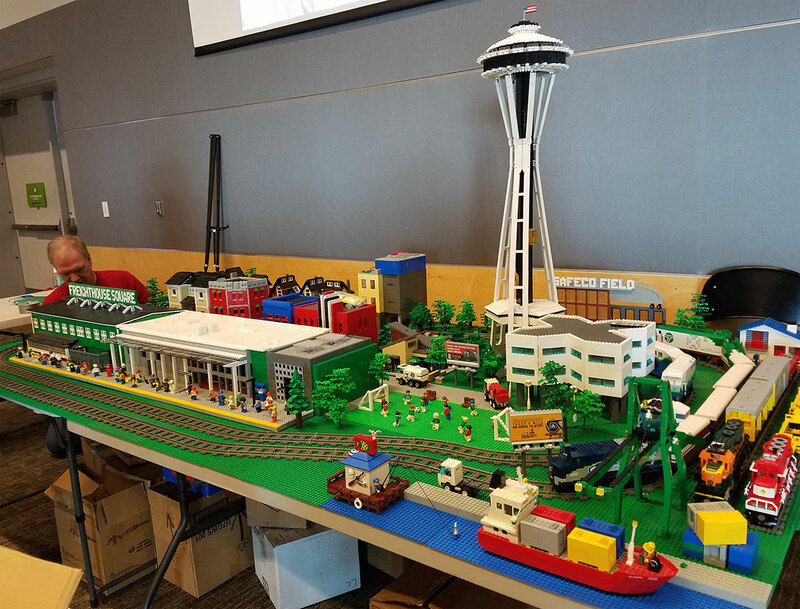 The Lego station was a popular stop for many participants and included take home kits to build their very own Amtrak Cascades locomotive. Participants also were able to pose with a life-size banner of our new diesel-electric locomotives that will start running this summer. For those kids hankering for a train ride, a mini train operated in the parking lot. area was a big hit at our railroad safety event May 28 in Lakewood. In addition to Sunday's event, our partners at the non-profit Operation Lifesaver organization have made more than 75 presentations at area schools this year. Partnering with the Seahawks ups our train safety game by spreading the message even further. We're excited about the new expanded Amtrak Cascades service starting this fall. It will add two daily round trips between Seattle and Portland (for a total of six), cut travel time and improve on-time reliability. But our first priority is always safety, so please follow Baldwin's advice and remember to always Stay Back from the Tracks. inspection to preserve as many of the existing trees as possible. We love our green, tree-lined scenery and the Interstate 405 corridor is no exception. However, sometimes our construction projects require us to remove vegetation to make room for new roadway features that will ultimately help travelers and nearby residents. We’d like to let you know about some recent activities on I-405 that require tree removal, and what we’re doing to balance this work. Starting this spring, construction crews will remove trees in two locations near I-405. The first location is on our property on the east side of northbound I-405 in Bothell between State Route 527 and I-5. The second is on our property on the southeast side of the northbound SR 167 ramp to northbound I-405 in Renton. If you drive on northbound I-405 in Bothell between SR 527 and I-5 during the afternoon commute, you have probably noticed and possibly used our new peak-use shoulder lane, designed to help keep traffic moving more smoothly in this congested area. Another part of this project is building a quarter-mile long noise wall for nearby neighbors. 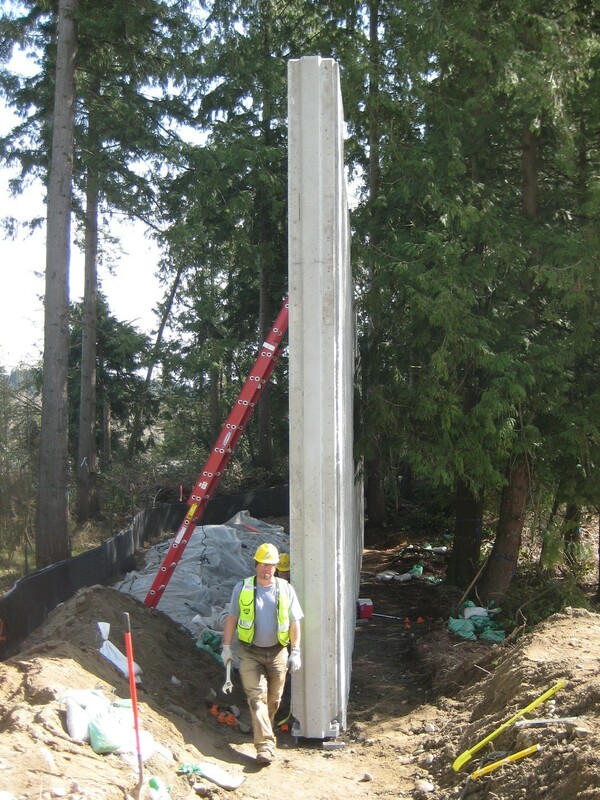 To make space to build this wall, we needed to remove selected trees on our property east of northbound I-405 between 202nd Street Southeast and Richmond Road. That work started this spring and is scheduled to wrap up by the end of next week depending on weather. In Renton, we are well under way with our I-405/SR 167 Direct Connector project, which builds a new flyover ramp connecting the I-405 carpool lane to the SR 167 high occupancy toll lane. To make space to build that new structure, we need to move the existing noise wall in this area farther east. As a result, we need to remove selected trees in the Talbot Hill area to make room for the relocated wall and the new road improvements. We expect to start that work in early June. trees that we take down as part of a project. We understand that seeing trees come down can be upsetting, and we don’t take this task lightly. We are well aware of both the habitat and aesthetic value that roadside vegetation brings to the traveling public. 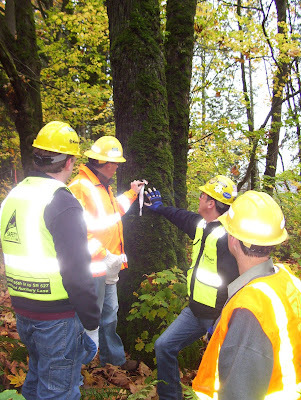 Before any tree removal occurs, our environmental specialists walk the project area to complete a strict review process. We work to preserve as many trees as possible, especially older ones. We collaborate with our contractor to make an effort to preserve more trees than the initial amount proposed in their project design. To ensure proper tree management, our contractor identifies and reconfirms all trees they plan to remove before work begins. Most importantly, for every tree removed, we replant many new trees in the project area. Our policy requires us to calculate the number of trees to replant based on the diameters of the existing trees’ trunks. For example, we replace trees with trunks greater than four inches in diameter with multiple trees. For smaller trees with trunks less than four inches across, we replant one tree for each tree we remove. We have this policy in place to enhance the state’s quality of life by building transportation investments that promote energy conservation and protect the environment. We make sure that crews remove only the trees necessary to complete work within the project area. Sometimes we get requests from homeowners to remove additional trees for other reasons, such as to improve their views. We only remove trees and vegetation if necessary for the scope of a project, or if they could pose hazards to drivers or nearby residents. So if you’re driving along I-405 in the next few months and notice less vegetation in either of these two locations, you can count on us to add far more trees in the project area. Join us for the Chimacum Community Celebration, June 22! 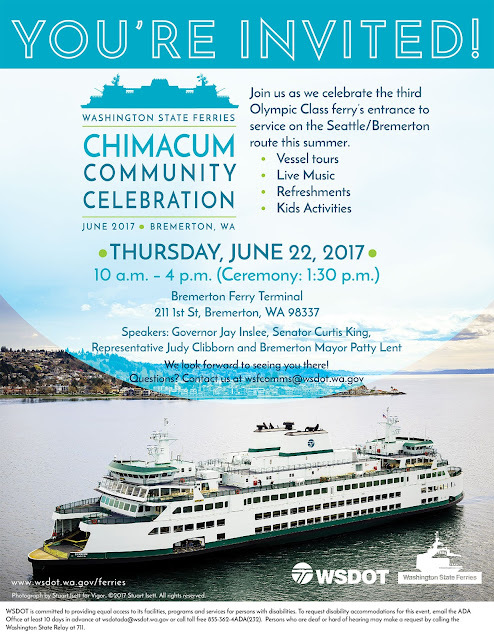 Help us welcome our third Olympic Class vessel, Chimacum, to our ferries fleet by joining us on Thursday, June 22 in Bremerton for a community celebration! This event is free and open to the public. At the event you’ll get a chance to tour the vessel, hear some live music, there will be activities for kids as well as refreshments to enjoy. Chimacum is the third of four Olympic Class ferries that are replacing some of our oldest vessels. Tokitae debuted in 2014 and Samish joined us in 2016. Suquamish is under construction at Vigor’s Harbor Island Shipyard. These vessels carry 144 vehicles and have a variety of improvements over our older vessels, including wider car deck lanes, improved access and safety, increased passenger comfort and a reduction in environmental impact and operating costs. We encourage attendees to take public transportation to the event. From Kitsap County: Bus Routes to Bremerton Ferry Terminal include: 11, 20, 21, 22, 24, 25 & 26. From Seattle: The Seattle/Bremerton sailing schedule is available online. There will be no public event parking at the terminal. There are several parking lots within 3½ blocks of the terminal. For more information, visit the City of Bremerton parking web page. We are committed to providing equal access to its facilities, programs and services for persons with disabilities. For more details on access to the Bremerton Transit Center for disabled passengers please check this Disabled Pick-Up/Drop-off Map. To request disability accommodations for this event, email the ADA Office at least 10 days in advance at wsdotada@wsdot.wa.gov or call toll free 855-362-4ADA(232). Persons who are deaf or hard of hearing may make a request by calling the Washington State Relay at 711. Drivers at I-5's exit 119 near DuPont and Steilacoom are seeing more green and less red these days. Changes to the crossing signals and lights led to longer than expected delays when they first went live a couple of weeks ago. Due to unanticipated growth in the area, traffic volumes at this interchange grew much faster than originally predicted in 2012 – we're already at levels not predicted until 2030. As a result, backups were longer than expected and drivers sometimes had to wait through several signals to make it through the intersection. We know this was frustrating and began looking at all possible solutions or remedies. help traffic flow more smoothly through the intersection. The change in signal timing was part of the larger Point Defiance Bypass rail project, which will reroute passenger train traffic through the area starting this fall. Shortly after the new signals went live, though, it was clear the change was causing frustration. We adjusted the signals to display a green turn arrow more often to help ease congestion and wait times, but knew more work was needed. An additional signal box like this one will help timing and traffic at exit 119 off of I-5 in DuPont. 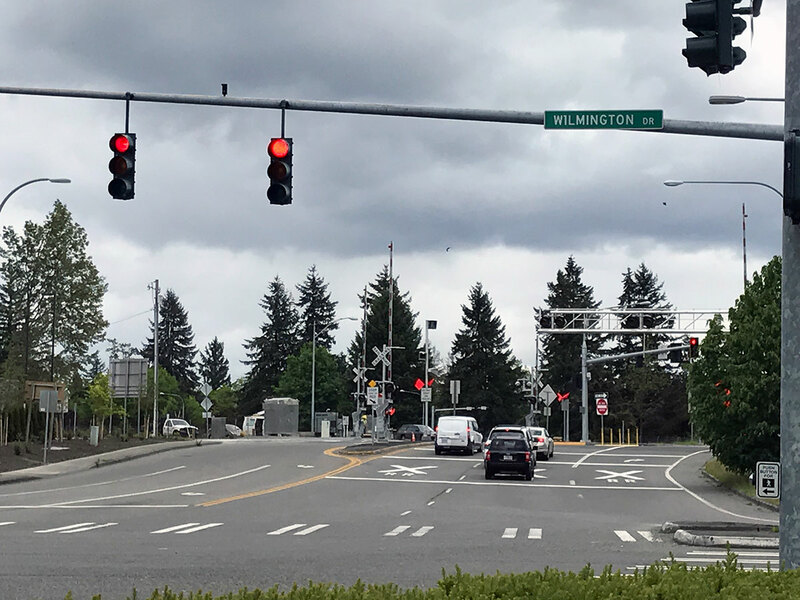 Last week we added a second controller at the Barksdale/Wilmington/DuPont-Steilacoom intersection. The controller is what directs the signals, including which color light to display and for how long. 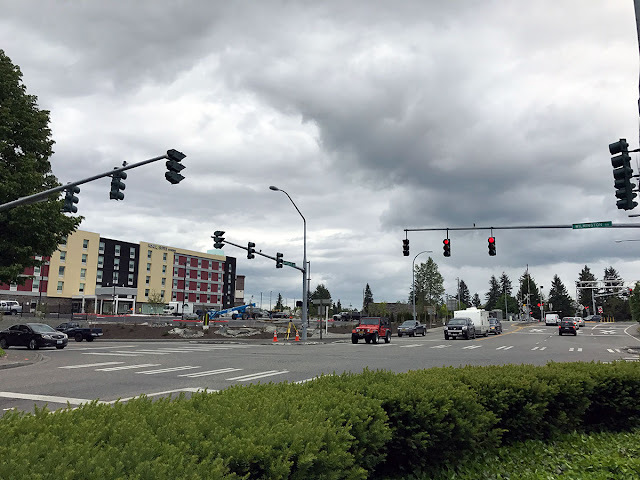 A second controller means vehicles are moving through the intersection faster and drivers are seeing longer periods of "green" lights, especially for those vehicles traveling south on DuPont-Steilacoom Road approaching Barksdale. We're seeing shorter lines and fewer backups in the area, which is good news for everyone using the intersection. In addition, we're working on traffic/railroad signage revisions to better guide motorists through the intersection and rail crossing. We're also going to restripe the area to better define where vehicles should stop for the crossing. safety near railroad tracks but led to some significant congestion. Long-term, we've committed to working with DuPont city leaders on an overall transportation plan for the city as the area continues to grow. The lights still may require some adjustment for residents, but we hope the alterations we implemented have made that change easier. Safety was the top priority when we met with community leaders about this project starting in 2010, and these changes are designed to address those safety concerns by reducing the chance of collisions. Our work to #ReviveI5 in South King County is about to ramp up! 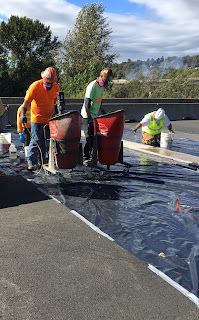 Since mid-April, crews on northbound I-5 between Kent and Tukwila have been replacing broken concrete panels, grinding the concrete to eliminate ruts, repairing concrete and much more - all while many of us are sleeping. The cracker slowly rolls down southbound I-5, breaking the 50-year-old concrete panels. By 10 p.m. Friday, northbound I-5 will be down to two lanes. Between 11 p.m. and 4 a.m. on Friday and Sunday nights, northbound I-5 may be reduced to one lane. By 5 a.m. Monday all lanes will reopen. Why limit lanes on the weekend? The simple answer is, there are some things we can't finish during an overnight lane closure. When we do crack-and-seat work, we have to remove a football-field length of concrete panels across two or three lanes at each end of the work zone and replace them with asphalt. You can't dig up that much concrete, then repave with asphalt in a single night. During southbound work in 2016, crews use a roller to smooth out a section where new asphalt will be paved. Besides replacing the concrete with asphalt, we have to use a cracking machine with a 12,000-pound blade to break a couple of miles of concrete. Crews then need to compress the pavement with a 35,000-pound roller. Next, we have to put asphalt over the top of that. We did this last year on southbound I-5 in the same area and it took all weekend to finish. We're still scheduling the last two weekends in 2017. Those will probably be in late summer or fall, when we'll replace four expansion joints on the Duwamish River Bridge. 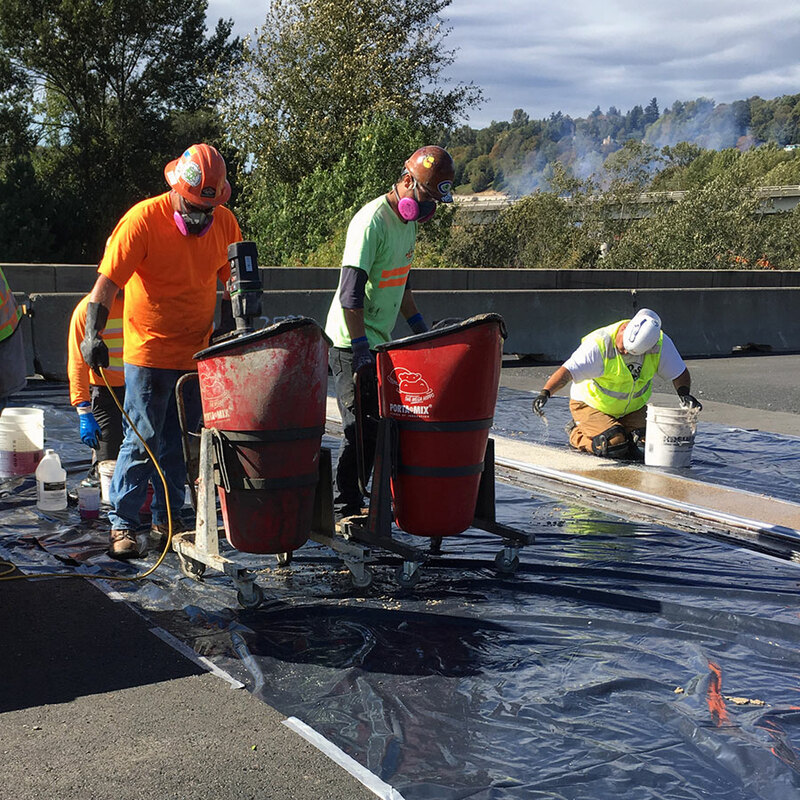 In the first half of 2018 we'll have two more weekends with northbound I-5 reduced to two lanes as we replace expansion joints on the Interurban Avenue overpass. It takes a weekend to chip out old expansion joints, place new ones and pour the concrete. We understand the inconvenience of all this work, but I-5 is more than 50 years old. If we want it to continue serving our families and businesses another 50 years, it needs major preservation work. The weekend-long lane closures allow us to complete parts of the project that need more time. You can stay updated on work and traffic by checking our construction update page, following our Twitter account, checking our traffic map and downloading our mobile app. We know our holiday travel charts are popular – we get requests for them well before most holidays and drivers were disappointed last year when we were unable to produce Fourth of July forecasts. Our Memorial Day Weekend charts are now out, but how do we make each year’s forecast? Good question. The quick answer is a healthy mix of facts and figures with a dash of common sense. Staff in our Travel Data and Analysis office start out with historical traffic data from our roadway traffic sensors, then add in some analysis to improve the forecast. sense goes into predicting when the heaviest travel times will be. An example? Last year there was a sudden mid-day dip in congestion on I-90 on the Saturday of Memorial Day weekend. That didn’t look right to our traffic engineers when they pulled up the numbers this spring, so they did some sleuthing. Turns out there was a large crash which temporarily stopped all traffic. Fewer vehicles moved past our sensors – but only because they couldn’t move, not because there were fewer drivers on the road. Using data from other years, we adjusted the charts to predict the steady congestion we expect to see this year. Without that adjustment, the straight numbers could lead people to think that several hours midday on Saturday will have relatively low congestion, when we expect exactly the opposite to take place. Once the data is collected and analyzed, staff from our graphics and web teams format the charts so they’re ready to share with the public. We try to release the charts a week before major holidays to give people plenty of time to make plans. How should I use the charts? The charts are forecasts of the entire corridor – not an exact spot or milepost. They’re also tools to help in planning, not promises or guarantees. A crash or sudden, bad weather, for example, can change conditions and forecasts rapidly, so be sure you’re always prepared with supplies and check traffic conditions before heading out. before 9 a.m. or after 9 p.m. to avoid heaviest congestion. Our traffic engineers suggest looking at the overall trend the charts show and then plan accordingly. The number of vehicles isn’t as important as the overall arch showing heavy congestion times. Is late afternoon and evening looking congested? Consider leaving earlier in the day or postponing travel until late evening or the next morning. If you have to travel during a peak time, recognize there will be lots of traffic and give yourself plenty of extra travel time so you’re not rushing or distracted by watching the clock. Historically, our forecasts are pretty spot on. But ideally, our analysts hope that by sharing the predictions they’ll actually be proven “wrong.” If enough people adjust plans and travel during non-peak times, they say, it helps everyone travel more smoothly. Are charts from previous years interchangeable? We’re often asked why we can’t use last year’s charts for the current year. This is where the human factor and experience play a role. If the Fourth of July is on a Saturday, for example, we might see most people travel on late Thursday/early Friday and Sunday. If the holiday is on a Sunday, though, Friday night/Saturday morning and Monday afternoon become the most popular travel days. Those are things our engineers factor into their predictions. 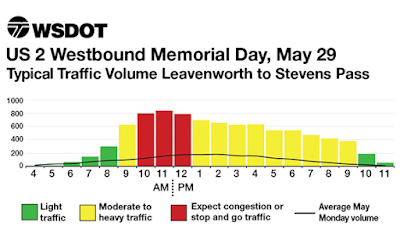 Memorial Day Weekend but traveling early or late will help. Why don’t you have Seattle travel charts? We get this question a lot. The answer is that Seattle is large enough that it doesn’t act like a typical traffic corridor because it has too many different ways to get around. Going north/south, for example, you can use I-5, I-405, SR 99 or a variety of city streets. That makes it hard to predict with good accuracy. 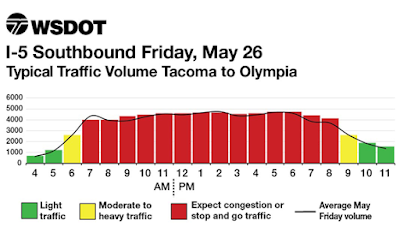 Our charts focus on the corridors where we see the most congestion without nearby alternative routes: I-5 from Olympia to Tacoma; I-90 over Snoqualmie Pass; US 2 between Stevens Pass and Leavenworth and I-5 near the Canadian border. In these cases, those routes are essentially the only viable options. Why can’t you make the charts for every weekend, or my morning commute? We’re happy the charts are useful enough for people to want them on a regular basis, but it takes a significant amount of time to do the analysis for each holiday – especially researching anomalies – and we don’t have the resources to do that on a regular basis. Heading back from a trip to Eastern Washington on Memorial Day? The roughest US 2 traffic will be from 10 a.m. to about 1 p.m. If you want to do some comparison yourself you can get an idea of area traffic volumes using our Map Archives page, which lets you search by area, date and time of day. It won’t have analysis or as much historical data, but it can give you an idea of typical traffic at a given time. What about Fourth of July this year? Normally, we don’t create charts for holidays that fall midweek, including this year’s Fourth, which falls on a Tuesday. There are many more variables about when or if people choose to travel on those holidays. Last year, a glitch in our system prevented us from producing Fourth of July charts, which disappointed many. So, would Fourth of July charts be helpful this year – with the caveat that the dates people may travel may not be as clear? Or should we stick to charts only on three- or four-day weekends? Leave your comments on this blog or email to: laboeb@wsdot.wa.gov and we’ll use them as we make our decision. 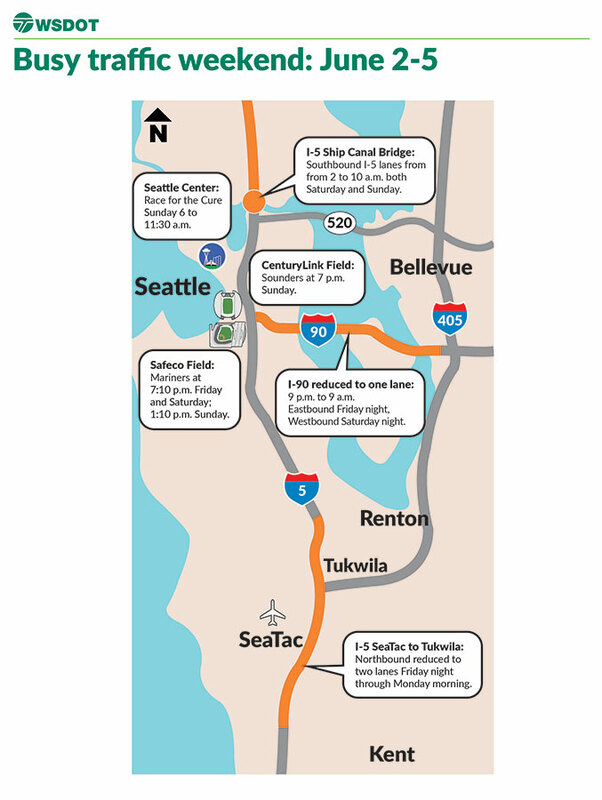 Heads up, southbound Interstate 405 travelers near downtown Renton: Your driving experience will be a little different starting next week, especially if you rely on the ramp to southbound State Route 167. As early as Saturday, May 20, we'll be making a long-term change to the way drivers access the off-ramps from southbound I-405 to Rainier Avenue South (Exit 2B) and southbound SR 167 (Exit 2A). Right now, these two streams of traffic are separated by a barrier and travel in two parallel ramps. The far right lane takes travelers to Rainier Avenue South, and the second lane from the right takes travelers to southbound SR 167. I-405 to Rainier Avenue South and SR 167 as early as this weekend. Under our new configuration, we'll combine those two exit lanes into a single lane. That means if you're traveling from southbound I-405 to southbound SR 167, you'll need to make sure you follow the new signs and get in the far right lane. But rest assured, you'll still be able to get to both exits, as the lane will allow exits to both destinations. The barrier separating the two exit lanes will include an opening for those who wish to take Exit 2A. access Rainier Avenue South should stay right, and go left to get to SR 167. Will this change affect traffic? After we built an off-ramp to Talbot Road South several years ago, the volume of traffic using the Rainier Avenue South ramp dropped to around 200 to 300 vehicles per hour. We don't expect major backups as a result of this change, but there may be some minor slowdowns in the area as drivers adjust to the new configuration. Combining these two ramps while still allowing access to both exits will help crews move forward with the I-405/SR 167 Interchange Direct Connector project, which started construction last fall. We're in the process of building a new flyover ramp connecting the I-405 carpool lanes to the SR 167 high-occupancy toll lanes. 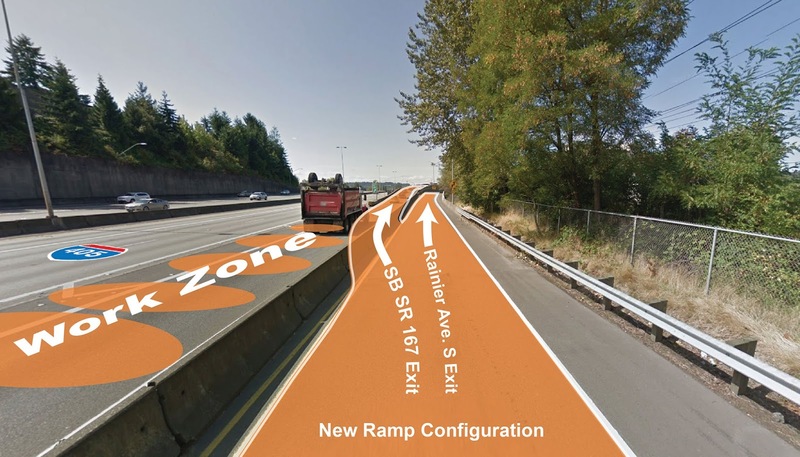 Once open, the new flyover ramp will provide HOV drivers and transit a new option for traveling between I-405 and SR 167 while taking some pressure off the general-purpose ramps. We expect to open the flyover ramp to traffic in 2019. You have probably already noticed that traffic has shifted lanes on northbound I-405 in the same area. This second traffic shift is to create a work zone to prepare for building the new flyover ramp in the center of I-405. How long will this traffic shift be in place? This change will be in place for at least several months as crews continue construction work for the Direct Connector. This work is weather dependent so for the latest construction closure information, please visit our I-405 Construction Updates page and our King County Construction Updates page. If you drive on I-90 between Seattle and Bellevue, you’ve probably noticed some pretty apparent changes to how the roadway looks over the past few weeks, including a big shift of the three existing lanes to the right side of the roadway. This shift is making way for the extension of the HOV lane from Mercer Island across the floating bridge to Seattle. The new HOV lane will open the weekend of June 3. At the same time, the I-90 express lanes will permanently close to allow construction of Sound Transit's East Link light rail extension from Seattle to Redmond. While our contractor is working hard to get ready to make this happen, it’s also time for you to start thinking about what these changes mean for your I-90 drive. Over the next few weeks, you can expect to see more work in the corridor as crews make the final preparations for the new HOV lanes and the closing of the I-90 express lanes. There’s approximately 14 miles of striping between I-5 and Bellevue Way that needs to be done before we can open the lanes, as well as the final testing of the new tunnel operations system, and other work like signing and irrigation systems. As you’re driving through the corridor be on your A game and pay close attention. The roadway will be changing and in transition for the next month or so. You can also expect a period of adjustment when the new HOV lanes open and the express lanes close. This is a big change for everyone that uses I-90 across Lake Washington. It could take months for traffic to settle into its new routine. I cross Lake Washington on I-90 all the time. What does this mean for me? Let’s walk through the overall changes and then get into some details for specific areas. The existing HOV lane currently starts or ends – depending on the direction you are traveling – near 80th Avenue SE on Mercer Island. After the weekend of June 3, this lane will extend all the way across the floating bridges to Rainier Avenue in Seattle. There will be one seamless HOV lane between Seattle and Issaquah that doesn’t depend on the direction of the express lanes. The I-90 trail will remain open and unchanged for those who use it to bike, run or walk. Buses between Seattle and the Eastside will continue to use the same routes and stops they do today. The new HOV lanes will start or end here depending on the direction you are traveling. The ramps to and from the express lanes near the Mount Baker Tunnel will close. The express lanes HOV ramps at 5th Avenue S in Seattle will become bus only. The I-90/Rainier Freeway Station will remain open for bus riders heading between Seattle and the Eastside. It will continue to operate until September 2018 when Sound Transit begins construction on the Judkins Park Light Rail Station. The express lanes ramps at 77th Avenue SE and Island Crest Way will close. The westbound Island Crest Way on-ramp will become HOV only. You’ll need at least two people in your vehicle to use this ramp. Solo drivers will need to use 76th Avenue SE, East Mercer Way or West Mercer Way to access westbound I-90. An eastbound HOV exit from the new HOV lane to Island Crest Way will open in mid-July. The existing right side exit will remain open. The express lanes ramps near East Mercer Way will close. These are obviously some major changes on a very busy corridor. The key will be studying up on what to expect, familiarizing yourself with the changes and then paying close attention when you’re on the highway. There will be a bit of a learning curve but eventually the new normal will kick in. After smashing several record rainfall totals since late last year, many of us are chomping at the bit to get out and enjoy the sun in our spectacular state. Once you get rolling, hitting the brakes can put a hitch in your giddy up unless you plan ahead. It’s no coincidence that construction season and warmer weather go hand in hand in the Pacific Northwest. Higher temperatures warm the roadway surface, which makes new pavement stronger and more durable. Resurfacing a highway in cool, wet conditions jeopardizes the quality of the final product. Waiting until we have long stretches of warm, dry weather means we get the best bang for our buck and ensures pavement repairs will last for years to come. 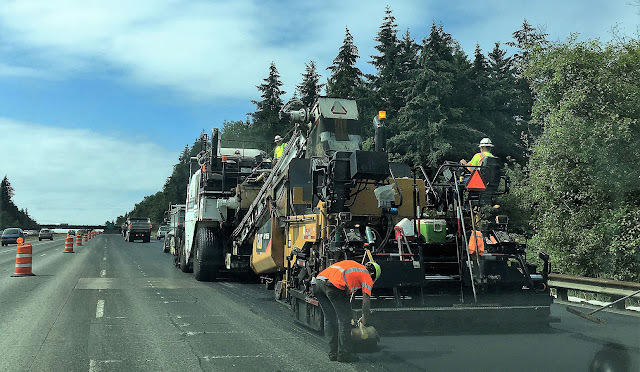 Last fall, resurfacing projects on State Routes 4, 411 and 432 in Cowlitz and Wahkiakum counties were put on hold due to cool, wet weather conditions, but with better weather in the forecast, construction resumes next week. While these projects will go a long way to preserve our transportation infrastructure, traffic delays are expected while crews are on the road. To minimize the impact of construction delays, a good portion of the work and lane reductions will take place overnight. With almost 20 miles of resurfacing work to be done, it’s a good idea to plan ahead. Sign up to receive email traffic alerts or check current traffic conditions via our mobile app. More than seven miles of SR 432 from SR 4 to 3rd Avenue in Kelso will get a fresh layer of pavement. Crews will also replace more than 60 broken and unstable concrete panels under the surface of the roadway to prevent additional deterioration. A stretch of SR 432 in Kelso will get new pavement and concrete panels this summer. Crews will resurface more than three miles of pavement on SR 411 between Longview and Castle Rock, along with intersection, crosswalk and striping enhancements along the corridor. will see pavement and lane marking enhancements during a summer project. Almost nine miles of pavement on SR 4, between Kandoll Road and Ingalls Road through Cowlitz and Wahkiakum counties will get a new protective surface. 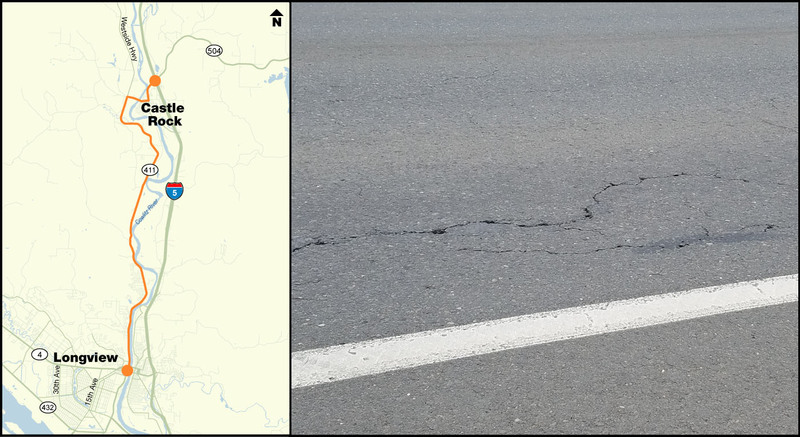 About nine miles of pavement on SR 4 through Cowlitz and Wahkiakum counties will get a new protective surface this summer. By the time fall comes around, we’ll all be restocked with our fair share of vitamin D and these resurfacing projects will provide a smoother ride as we roll into another wet winter. Somewhere between zero and one. That’s the average number of weekends in June, July and August where there isn’t a game, concert or some event happening in the Seattle area. These warmer and drier months also happen to be primetime for highway construction. So how do our traffic engineers plan projects given the near impossibility of an open weekend in the summer, while still trying not to affect drivers too badly? A major part of the northbound I-5 rehab project from Kent to Seattle is replacing aged concrete panels. Indeed, it takes months of working with project staff to figure out how to fit all the needed work in while also avoiding major events like Seafair weekend, Independence Day weekend and the Bite of Seattle. Keeping as many highway lanes open as possible during those huge events is important, but it starts to cut in on viable work time. One of the biggest projects in the Seattle area this summer will be #ReviveI5. 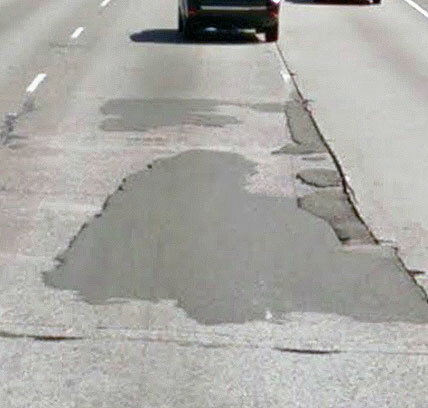 The northbound I-5 pavement preservation project between Kent and Seattle will require 10 weekends of lane closures, eight of those this year. These weekends are necessary because some of the work, like replacing expansion joints, simply can’t be done overnight. Two hours on the front end and back end to set up and take down the traffic control and heavy equipment would leave only a few hours to do the job and would also extend the timeline and raise the cost of the project significantly. I-5 has lasted 51 years, but it’s time to give the highway some much needed work. As significant as the actual repaving and panel replacement is, scheduling this critical preservation work is equally important. When we schedule weekends, where drivers are traveling for particular events, other projects as far away as Tacoma, and local city and county projects are happening at the same time all have to be taken into consideration. We all want to take advantage of the few drier months of the year but we can’t all work at the same time. It’s akin to trying to fit a bunch of puzzle pieces together – accounting for all the variables to put everything together to avoid conflicts between projects, as well as schedule closures so that the effects to events are kept to a minimum. And the infamous Washington weather is a major variable that is out of our control. The schedule is tight enough, but pushing work back due to rain, forces those closures up against bigger event weekends at times. “We try to think outside the box as much as we can,” Swires said. What’s the best way to complete the work? Do we close one direction of I-5 completely one weekend to cut down on the total number of weekend closures? Do we close a ramp here or there? What about partnering with the city and detouring traffic through surface streets? Could they handle the 100,000 vehicles that use this section of I-5 each day? These are all challenging questions to address and the population boom in the area hasn’t made the task any easier. While we try to keep our closures outside of heavier travel times, with as much growth as our area has seen, road work will always impact someone. Planning major summer roadwork around big events like the Bite of Seattle is a huge challenge. (Photo courtesy of Bite of Seattle). Drivers have a part to play in these closures too. Engineers do their best to dodge a minefield of events, but travelers need to know before you go. They can ease congestion during the busy construction weekends by carpooling, using alternate routes and planning their trips accordingly. By planning ahead and knowing what’s going on on the highways, we can all get the most out of a busy and fun summer. Why all the construction on I-90? You may have already heard we have a lot of construction taking place this summer on I-90 between North Bend and Ellensburg. But you may be wondering why we are doing all this work? Good question. Snoqualmie Pass East improvements: Traffic congestion is a huge issue on I-90 east of Snoqualmie Pass, especially during major holidays and summer weekends. The multi-year project we have been working on between Hyak and Easton is going to relieve that congestion by widening I-90 from four to six lanes. We are also removing rock from the slopes above I-90 to stabilize the hillside and prevent rocks from falling onto the roadway – hence all the nighttime blasting closures over the years. Rock blasting isn’t expected to start until June and you can check our What’s Happening on I-90 webpage for specific days and times. This project is also building bridges, some even for wildlife and avalanches. The first seven miles of this 15-mile project is scheduled to be complete by 2019. You won’t see construction on the remaining eight miles for another couple of years. We are still working on the design. Summer is a busy time for traffic across I-90 but it’s also a busy time for construction work on the corridor. Cle Elum to Elk Heights pavement repair: Work continues between Cle Elum and the Elk Heights area to replace cracked sections of the westbound lanes. If you have ever driven on this section of I-90, you know how rough it is as the pavement along that stretch is more than 45 years old. We started work on this section of I-90 last summer and will be finished by this fall. North Bend to Snoqualmie Pass pavement and bridge repair: Later in May, we will be working on another rough section of I-90 from North Bend to the summit of Snoqualmie Pass. We will be replacing pavement on the eastbound lanes and repairing several bridge decks in the westbound lanes as well as a bridge deck in the eastbound lanes just east of North Bend. We are also going to be making repairs to bridge decks between Easton and Ellensburg. A lot of our bridge decks have taken a beating over the years and can cause a very bumpy ride. We opened one new avalanche bridge on I-90 across Snoqualmie Pass last August, and another will be complete in 2018. 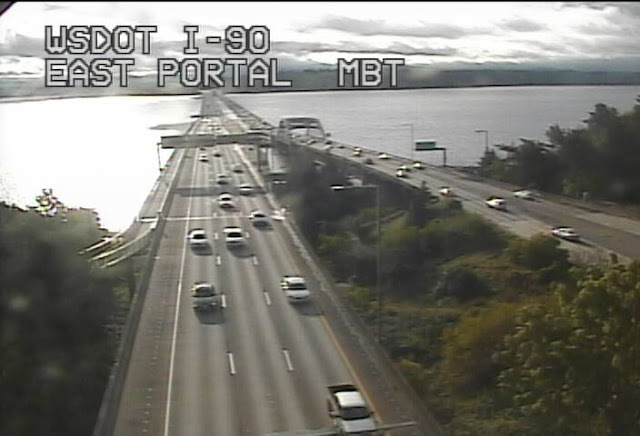 Obviously summer is a popular time for people to be traveling and I-90 is a heavily-used route for that. At the same time, we need dry, warmer weather for much of this work, in particular the extensive pavement and bridge deck repair as warm temperatures are much more conducive to concrete setting correctly and lasting long term. It’s impossible to do this type of work, especially this time of year, without there being traffic backups. We have to close lanes to get this done and to keep our work crews and travelers safe. We hope knowing about the improvements we’re making to I-90 will take some of the sting and frustration out of being stuck in traffic. Much of the work on I-90 this summer involves replacing aged and cracked pavement, giving travelers a smoother trip. That said, we have many resources to help you plan your trip across I-90 this summer. We have information about construction on multiple websites, including the What’s Happening on I-90, Snoqualmie Mountain Pass and Traffic Alerts pages. Follow us on Twitter @snoqualmiepass and @wsdot_east or sign up for email updates or subscribe to our text message alerts by sending the phrase “WSDOT Snoqualmie” to the number 468311. Our mobile app has proven to be a popular addition to our online traffic tools since it went live in 2010. Users receive live traffic conditions; ferries information and mountain pass reports, among other features, to help plan their trips. Now we’re excited about a new addition that should make it even more convenient. Our new My Routes feature allows travelers to check for traffic closures, construction delays and other alerts in a specific area by creating a personal route. For example, if your daily commute takes you between Everett and Seattle, you can set that up and save it for easy reference to see what traffic conditions look like along your route. Creating a new route on the WSDOT mobile app with My Routes. See steps below. Using your phone’s GPS, My Routes tracks your trips and saves them within the app. Once it’s saved, you can then choose to automatically add content like traffic cameras, available travel times, ferry schedules and mountain pass reports to your favorites. Start at the WSDOT app home screen and tap the My Routes button. Tap the plus (+) button to add a new route. This will be in the top right for iPhones, bottom right for Android. 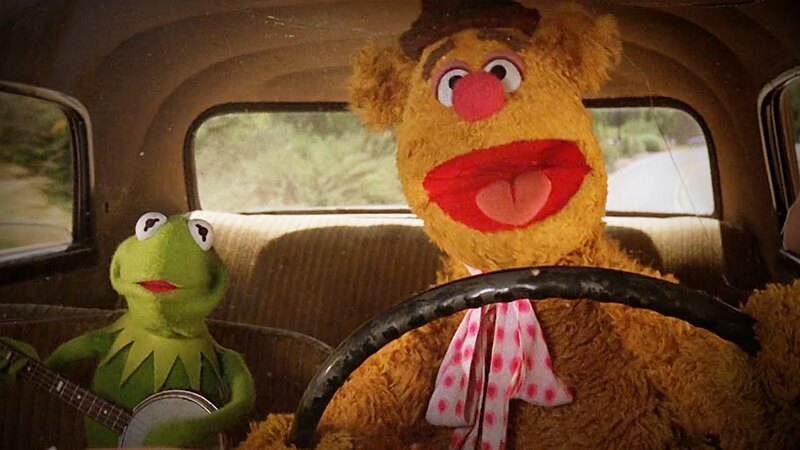 Once you're ready, tap the green start button, set your phone aside, and start driving. The WSDOT app will begin tracking your route with the device’s GPS. Once you’ve completed your route, tap “Finish” to save it. You can then access that route any time to get live information to help you plan your trip and know what traffic or closures await you. As with any of our communications tools, whether it’s our app, Twitter, Facebook or anything else, please don’t use your device while you’re operating your vehicle. Distracted driving puts you and everyone else on the road at risk. Check the app before leaving home, or if you have a passenger, have them check. We hope this new personalized feature is useful in helping you know before you go. With just a few more weekends of I-90 directional reroutes across Lake Washington left, the end is near for of the I-90 Two-Way Transit and HOV Operations project. The not so good news is that getting to that finish line will require work on a very busy weekend in the Puget Sound area. This isn’t ideal, but it’s necessary for us to meet our deadline of June 3 for opening the new HOV lanes across the highway and closing the express lanes to allow Sound Transit to build light rail across the lake. Crews are getting close to finishing preparing I-90 for its new HOV lane across Lake Washington. The biggest piece of work left is restriping the roadway to create room on the left side for the new HOV lane. After this weekend, things will look different in the eastbound direction of I-90, especially inside the Mount Baker Tunnel. Pay attention, as how the roadway looks and functions will be changing over the next month. We expect a period of adjustment both as we get ready to open the new HOV lanes and when the new lanes open and the express lanes close on June 3. The Rainier Avenue South on-ramps to eastbound I-90 will be closed. A signed detour will be in place. The eastbound I-90 exit to Rainier Avenue South will be open. Drivers hauling flammable materials will need to use I-405, SR 520 or SR 522. The SR 513 Montlake Bridge will be closed for some of the day Saturday during the Opening Day of Boating Season festivities. But that’s not all. 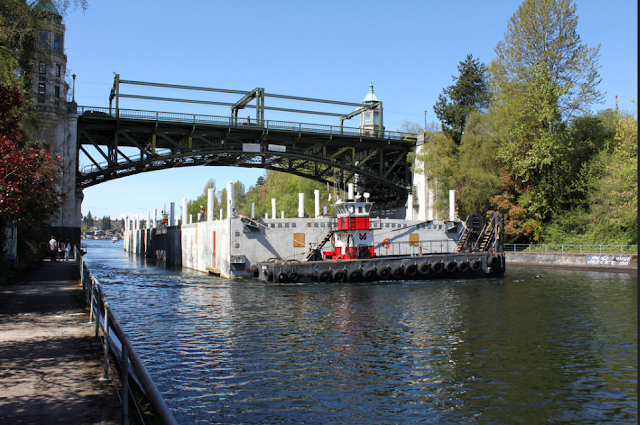 From 10 a.m. to 4 p.m. Saturday, the SR 513 Montlake Bridge will also close for the annual Seattle Yacht Club Opening Day of Boating Season parade. The westbound SR 520 exit to Montlake Boulevard NE will also be closed. A police officer will control traffic taking left turns from the eastbound SR 520 exit to northbound Montlake Boulevard NE. We need to close the mainline of I-90 to allow crews to complete upgrading the two tunnels and to stripe the highway into its new configuration, including the new HOV lanes. Crews must often work across all lanes of traffic in doing the tunnel upgrades, and to safely stripe the highway, traffic must be kept off of the lanes. There is about 14 miles of striping to do and by closing the roadway for the weekend, they should – weather depending – be able to get most of it done. Yes, this is a very busy weekend. Windermere Cup/Opening Day of Boating Season is from 10 a.m. to 4 p.m. at the Montlake Cut. Sounders MLS Cup rematch vs. Toronto at noon Saturday at CenturyLink Field. Mariners vs. Texas Rangers at 6:10 p.m. Saturday and 1:10 p.m. Sunday at Safeco Field. Unfortunately, there is no good weekend for this type of closure and we’re running out of weekends to get this done before our deadline. There are four weekends in May and two of them have the same Sounders/Mariners conflicts. Another is a holiday weekend. We do our best to work around as many major events as possible but in this case, it couldn’t be avoided. Sounder train service will be a good option for those headed to the Mariners and Sounders games this weekend. What am I going to see Monday morning? If all goes according to plan, drivers will start to see lanes shifted to the right and the area that will become the new HOV lane taking shape. Pay attention on Monday morning because things will look different, which also means drivers may be behaving differently. 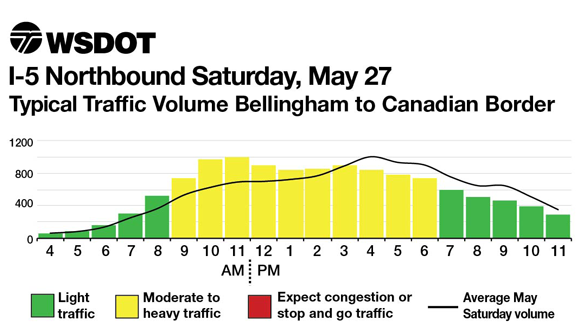 Westbound drivers should expect to see similar changes after the May 12-15 weekend. In the eastbound Mount Baker Tunnel things will be even more different. Instead of three lanes, drivers will see four lanes. Once they get out of the tunnels they’ll merge back into three lanes near the west high-rise. We realize this will be change for drivers so please pay attention to the new lane markings as well as the vehicles traveling around you. It always takes time for people to adjust to any traffic change, temporary or permanent. Ultimately the far left lane will become the new HOV lane but opening this small section to four lanes will help us keep drivers and workers safe while our crews finish work on the project. 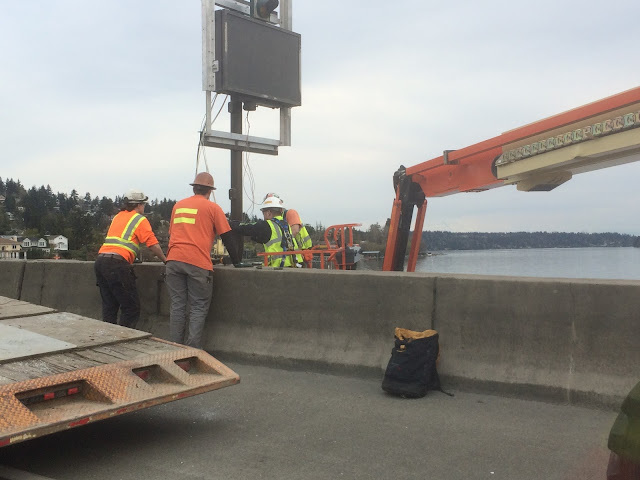 Eastbound I-90 across Lake Washington will be detoured to the express lanes this weekend. Why can’t you just open the lane after you’ve restriped? Adding the new HOV lane isn’t as simple as just restriping the roadway. There’s a lot of work that needs to happen over the next month before we can open the new lanes, including signing, irrigation and putting the finishing touches on all those tunnel upgrades we’ve been doing over the past two-plus years. Our crews are working hard to get everything done so we can open the new HOV lanes on June 3. What about tolls on SR 520? The I-90 bridge will still be open so while traffic congestion will be higher because of the reroute to the express lanes, it will still be possible to use the highway to cross the lake. Waiving tolls on the SR 520 bridge would have a significant effect on toll revenue which is needed to cover debt payments. We have to apply tolls fairly and consistently to be sure that happens, including when we have lane closures on I-90. If you’re headed to one of the events, leave as early as possible. We’re going to see added congestion on I-5, I-405 and other surrounding highways. If you don’t have to go into Seattle, now might be a great weekend to explore other parts of our state. Another option is using transit. Sounder train service will be available for the Sounders game Saturday and the Mariners game Sunday. You can also take the bus or light rail to events at the stadium. Those going to the Windermere Cup might consider taking light rail to the Husky Stadium station. Buses are another option but be prepared for some potentially crowded routes, and it’s National Bike Month so if you’re comfortable riding, it will help you avoid any parking stress. It’s going to be a challenging weekend but the end of this portion of the I-90 project is near and with some planning and adjustments, we’ll be able to head out and enjoy an exciting weekend. George Harrison may have said it best when he sang, “Little darling, it’s been a long, cold, lonely winter.” I think we’re all exhausted by the gray, wet months we’ve endured since October. Now that we’re seeing signs of sun, we can’t wait to get out and enjoy the rays. But nothing puts a damper on a warm-weather outing than being stopped by traffic backups and lane closures. Unfortunately, summer is the season for construction projects as much of our work requires predictably dry weather. 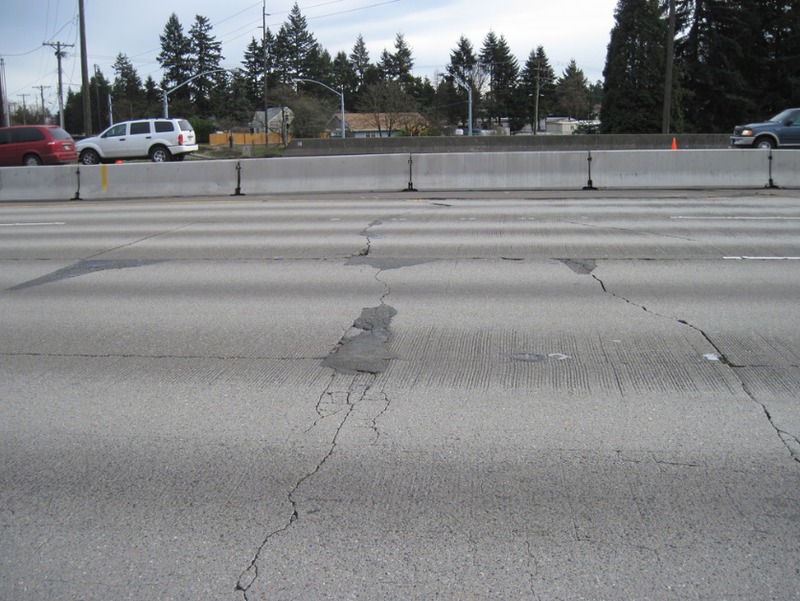 A major repaving project on northbound I-5 in King County will replace several aging and cracked panels like this. 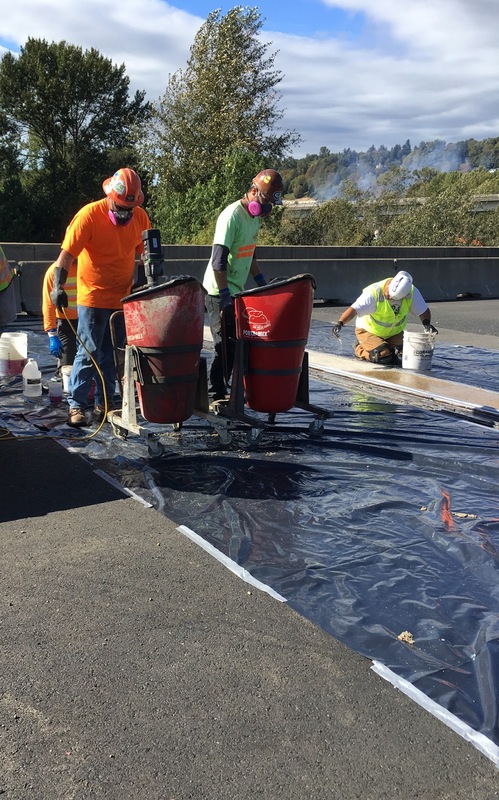 One of the bigger projects underway is #ReviveI5, the northbound I-5 pavement preservation project between Kent and Seattle, which will require six weekends of lane closures. If you are not prepared to adjust your weekend drive, be prepared to crawl through some potentially hefty delays. With about 100,000 vehicles using this section of freeway each day, we need help from drivers to ease the added pressure from closing lanes on this major north-south corridor. How can I avoid the backups? I’m so glad you asked. Think about what you do to prepare for your weekday commute. It’s important to stay engaged to find the best (read: quickest) way to reach your destination. Check our mobile app, our traffic map, follow us on Twitter, tune into local news, check your bus routes, tell a friend, etc. It might not be common practice to use those tools during the weekend, but it should be. Summer construction on northbound I-5 in King County could lead to some significant traffic congestion but some planning will help drivers work around it. Consider leaving early in the morning or later in the evening during the weekend construction work. Sure, some of your trips adhere to more specific events like a curtain time, reservation or first pitch, so this isn’t always an option. But if you can change your schedule, it may save you some time sitting in traffic. Drivers should consider carpooling or using transit to help avoid congestion when possible during northbound I-5 construction closures. This is the perfect time to grab a buddy or two. Find someone else who needs to travel and do it together. The fewer vehicles on I-5, the shorter the delays. Scared, unsure or uneducated about public transportation? Try something new. Hop on the light rail, take the bus, or look into a vanpool. Have snacks, water, entertainment for the kids and perhaps a few breathing exercises in your traveling toolbox. Sitting in traffic is worse when you’re hungry (and the “are we there yet! ?” chirps coming from the back seat don’t help)! No matter your choice, remember that knowledge is power. Spring and summer construction can and will create backups and delays, but with the help of drivers, we can get through this as pain free as possible. Seattle Seahawks wide receiver Doug Baldwin always has to be alert for hard-hitting defenders on the field, and he wants kids to be equally alert when they're near train tracks. 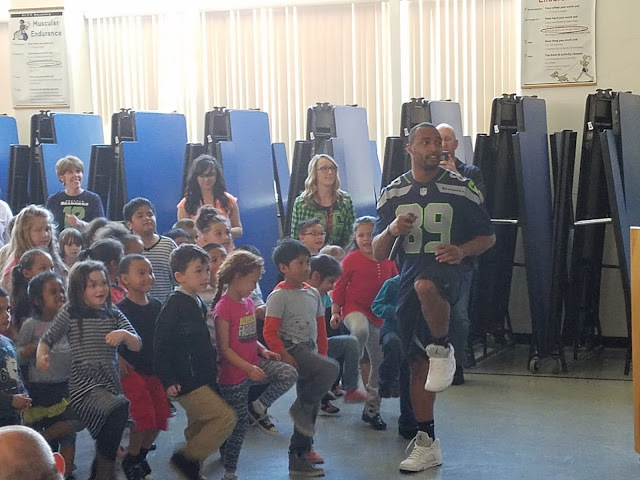 That’s why Baldwin surprised students at Tillicum and Tyee Park elementary schools in Lakewood Wednesday to talk about train safety. Both schools are near refurbished tracks that will soon carry our Amtrak Cascades passenger trains, and we – and Baldwin – want to be sure children and their families are extra aware and safe when the trains start running this fall. with an assembly to encourage safety near railroad tracks. 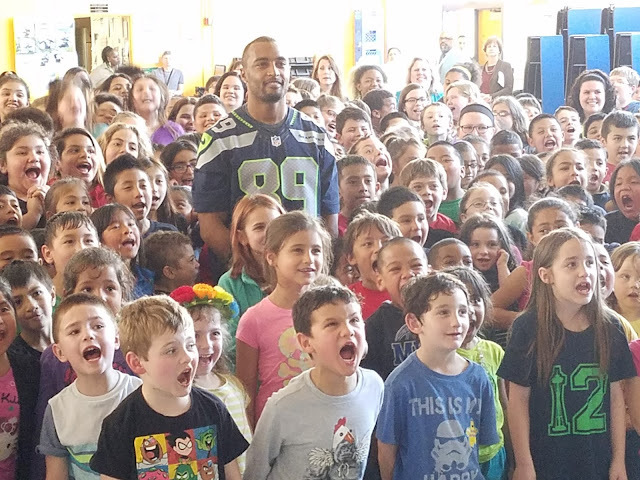 Students had no idea who was addressing them until the assembly began – and they certainly didn’t expect to be interacting with a Seahawks’ Pro Bowl wide receiver and Super Bowl XLVIII champion. Gasps, cheers and squeals of delight greeted Baldwin as he was announced in what was a surprise to many teachers as well as students. “I want you to be really, really safe around trains,” he told the assembly. Baldwin then led the students through an interactive video that stresses the need to be aware near tracks and to always obey safety signs. Trains may travel from two opposite directions, the children learned, so it’s never safe to assume you can walk around a signal arm, even if you’ve seen a train pass. in an exercise emphasizing safety and awareness near train tracks. Baldwin asked the students if they’re ever going to walk on the tracks? “Are you ever going to take a shortcut across the tracks,” he asked. Using the video to show kids real-life situations, Baldwin also “walked” them through several scenarios they’ll face near rail tracks. Making the safety lessons fun and interactive helps ensure children will remember the safety tips when they need them. And, as children share the news about Baldwin’s visit, they help spread the message to parents and others, increasing everyone’s safety. led by Seahawks Doug Baldwin. 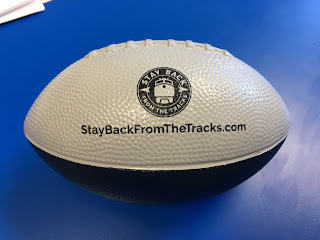 The Stay Back From The Tracks safety campaign is a joint effort between our agency, the nonprofit Operation Lifesaver group and the Seattle Seahawks. Safety is our top priority as an agency and we want to ensure residents know how to stay safe near active train tracks, whether they’re on foot or in vehicles. Beginning in the fall, 14 daily passenger trains, traveling up to 79 mph, are being re-routed to tracks that parallel Interstate 5 between Tacoma, Lakewood, JBLM, and DuPont. The multi-pronged safety campaign focuses on this change in service and we hope partnering with the Seahawks helps spread the message even further. The campaign also draws on the expertise of the non-profit railroad safety organization Operation Lifesaver, whose volunteers have made more than 75 school presentations in the area this year. Elementary School during a railroad safety assembly Wednesday. We had a great time sharing the train message with students and we know they loved meeting Baldwin. He may not be able to visit every school, but please remember his message the next time you’re walking or driving near train tracks: Stay back and stay safe. The latest I-405 express toll lane data is in and we are pleased to see that drivers between Bellevue and Lynnwood continue to see time-saving benefits in the express toll lanes. Between October and December of 2016, people who used the express toll lanes during the busiest hours of the day moved up to 24 mph faster than the regular lanes, and the express toll lanes carried up to 27 percent more vehicles per lane than the regular lanes. Data clearly shows that the express toll lanes are being utilized in a big way. While that is good news, the express toll lanes still have their challenges. Specifically in the area north of SR 522 in Bothell, demand during the peak commute exceeds the capacity with only one express toll lane. While there's no easy fix to that issue, we're working to find ways to help until a more long-term solution can be made. 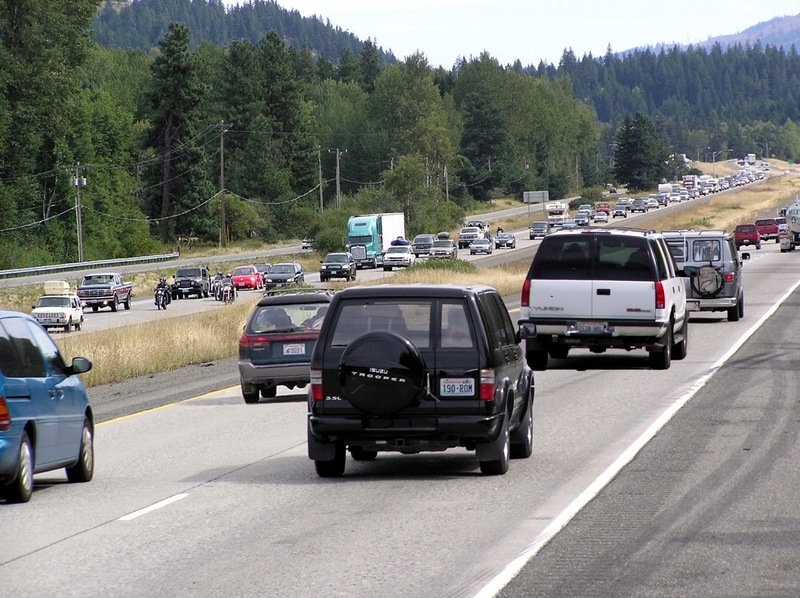 The Puget Sound region is growing by about 1,700 people every week and all of our roads are increasingly crowded. Like other freeways, I-405 is carrying more vehicles than it was last year. Unlike other roads, people on I-405 have a faster, more predictable choice to use the express toll lanes when they really need it. Every weekday about 51,000 drivers choose to get in the express toll lanes. In Kirkland, where there are two express toll lanes and five total lanes, the express toll lanes represent only 40 percent of the pavement but carry 44 percent of the vehicles. In Bothell, where there's one express toll lane and two regular lanes, the express toll lane is carrying an impressive 39 percent of the vehicles. Of course, these statistics vary depending on when and where you are looking, but it gets more impressive when you look at the absolute busiest times and places. For example, each morning from 7:30-7:45 a.m. there are an average of 315 vehicles travelling south past the SR 522 interchange in the single express toll lane, which is 23 percent more vehicles than each regular lane. In Kirkland from 4:30-4:45 p.m. there are 74 more vehicles zipping past NE 53rd St. in each of the express toll lanes – 12 percent more – than there are in each regular lane. There is a reason so many drivers are choosing to pay the toll to use the lanes: Time savings. Vehicles traveling between Bellevue and Lynnwood save an average of 11 minutes southbound and 15 minutes northbound. That's almost 30 minutes saved round trip and about 2½ hours a week. Overall, people in the express toll lanes moved an average of 20 mph faster than the regular lanes southbound during the peak morning commute times of 5-9 a.m. and 24 mph faster northbound during the afternoon peak times of 3-7 p.m. The average speed at the top of each hour during peak commute times in the express toll lanes. Of course, how fast you're traveling depends on where and when you are driving. Due to the different capacities in the single and double lane sections, travel times and average speeds vary a lot between these two sections. Data shows the fastest sustained speeds at the beginning of every hour during the peak commute were on the stretches with two express toll lanes. One way that we measure express toll lane reliability is by calculating the percentage of time that vehicles in these lanes are moving at least 45 mph. The goal is vehicles moving 45 mph or faster 90 percent of the time during peak periods. 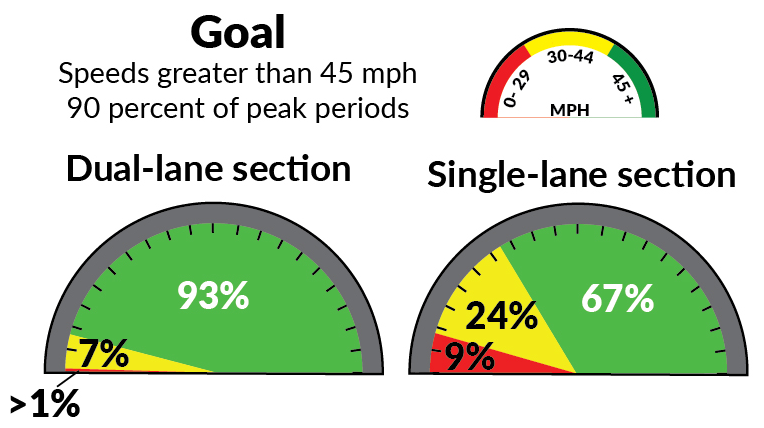 Before the express toll lanes opened, vehicles using the I-405 HOV lanes were only moving 45 mph 52 percent of the time. The express toll lanes provide more reliability and vehicles are moving at 45 mph 78 percent of the time during peak periods. When you break it down between double- and single-lane sections, you'll see why we aren't meeting the 90 percent goal. Where we built a new lane, speeds exceeded the goal 93 percent of the time between July and December. In the single-lane section where no new capacity was added, vehicles moved 45 mph 67 percent of the time. I-405 travelers on the stretch where there are two express toll lanes. While limited capacity combined with heavy demand is one factor in the performance of the single-lane stretch, congestion in the neighboring general purpose lanes – which causes vehicles to slow down while traveling in the express toll lanes and while trying to exit – and the very wet weather we've had are also factors. We are working to address the challenges as much as possible. We've used express toll lane revenue to improve speeds in the regular lanes between Bothell and Lynnwood with a new peak-use shoulder lane that opened on April 24. We're also building a new merge lane near SR 527 to give vehicles space to slow down and merge without creating a backup behind them. The new lane will provide drivers a place to pull out of the express toll lane before merging into the regular lanes. While these improvements should help specific areas, they aren't silver bullets to solve the fundamental issue with the single-lane section: There's simply half as much space and incredibly high demand for a faster trip. We need additional investment in the corridor to build a second express toll lane in the northern portion of the corridor. The latest transportation budget includes funding to continue engineering work for the potential first phase of major north end improvements, which would add a new lane and improve interchanges in the section of I-405 between SR 522 and SR 527. In fall 2016, the average toll paid for all trips on the express toll lanes was approximately $2.25 and the average toll paid during the peak periods was approximately $3.35. This is up about 35 cents from the previous quarter, continuing a trend we've seen since opening the express toll lanes in fall 2015. We've also seen an increase in the number of people choosing to pay a toll of $8 or more, which was eight percent of peak period tolls this past fall. With all that said, nearly 70 percent of all tolls paid during peak periods in the fall were $4 or less. At the end of 2016, the I-405 express toll lanes had generated $22.6 million in toll revenue. After expenses like customer service, operations, and maintenance, about two-thirds of this money will be spent directly on improvements to I-405, which will benefit drivers and transit riders in every lane. Want more data? Check out the full report in our project library.